Soy beans 500ml dried were made into three loaves of tempeh. They swell to 1000 liters during processing.Beans were boiled for 30 minutes, skins were removed by hand rubbing together under cold water. The skinned, split beans were then pressure cooked for 30 minutes. When cool a tablespoon of vinegar was added and the starter powder was mixed. The beans were then placed in a cotton cloth in a mold and placed in a fermenter set at 31C for 24 hours. The fermentation was adequate and the three loaves were perfect. Pictures depict the process. 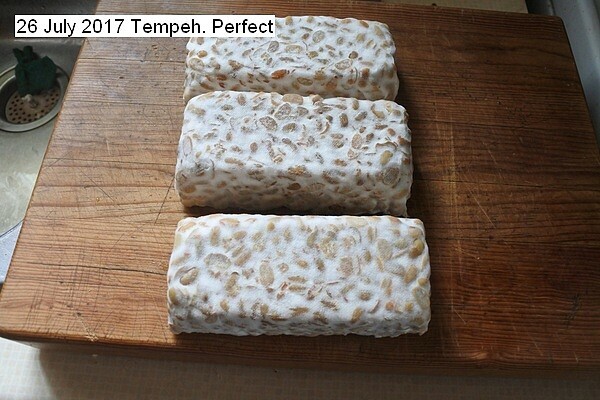 This entry was posted in Uncategorized and tagged 26 July 2017 Tempeh, Tempeh). Bookmark the permalink.